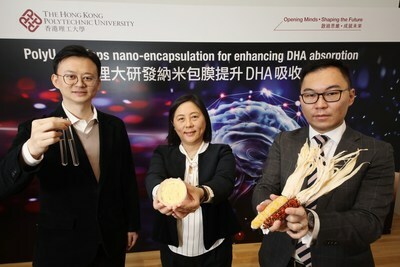 The Hong Kong Polytechnic University (PolyU) today announced the findings on its novel nano-encapsulation technology for optimising the maternal and fetal absorption of docosahexaenoic acid (DHA). The research, conducted by PolyU's Department of Applied Biology and Chemical Technology (ABCT), aimed to address the delivery and absorption issues of DHA that affect its potency and efficacy. "Our team innovated the nano-encapsulation technology, which is proven to be an effective technology to protect DHA from oxidation in vivo, thus enhancing the absorption and efficacy of DHA. Our findings also indicated that the technology can help overcome blood-brain barrier in DHA delivery. We therefore believe that the technology could be further applied to enhance the efficiency of drug delivery for the brain, such as those for patients with dementia or Alzheimer's disease," said Dr Wang Yi. To test the effectiveness of nano-encapsulation technology in enhancing DHA absorption, PolyU's team conducted some experiments on maternal mice and their offsprings. In two groups of maternal mice, each of six, fed with normal fish oil (Normal FO) and nano-encapsulated fish oil (Nano FO) respectively, it was found that the DHA concentration in the duodenum and jejunum of the Nano FO group is significantly higher than the Normal FO group (see Figure 1). The result implies that DHA, being protected by the encapsulation structure from oxidation and degradation under stomach's acidic conditions, is successfully released in the upper two parts of the small intestine of the Nano FO group. Also, the DHA contents in the brain of the Nano FO maternal mice were significantly higher (see Figure 2). This indicates that DHA was delivered to the brain of the Nano FO group more effectively as the challenge of the blood-brain barrier was overcome. The findings showed that the three groups, namely: Normal FO-high, Nano FO-low and Nano FO-high spent more time on novel objects rather than on familiar objects (see Figure 3), implying that they were more curious about new things and demonstrated better memory and learning capabilities. For the Nano FO-high group, they had higher amount of Brain-Derived Neurotrophic Factor (BDNF) in hippocampus (see Figure 4). BDNF, a protein activated by DHA, plays an important role in supporting the survival of existing brain neurons and encouraging the growth and differentiation of new neurons and synapses. They also demonstrated a significant difference to other groups in terms of better spatial learning and memory abilities in the Y-maze experiment (see Figure 5).